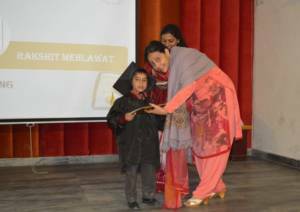 The Graduation Day of the Kindergarten Section was celebrated on 27th February, 2016. Celebrating a child’s preschool graduation is an emotional time for parents and also a time to celebrate a child’s academic and social accomplishments.The function began with the welcoming of the parents followed by the lighting of the lamp by Mr. Bhagat Singh, Principal, and Ms. Lata Rana, Vice-Principal. 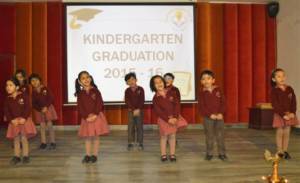 The program started by the recital of a prayer by our kindergartners followed by a marvelous dance performance by the nursery students giving them a memorable farewell. Our little graduates looked impressive in their gowns and caps making their parents proud. 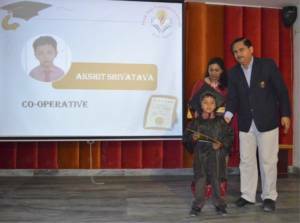 Diplomas and mementoes were given away by the school Principal and Vice-Principal along with loads of blessings.